If you are using the Mozilla Firefox web browser right now to download releases hosted on the project hosting website Github, you will notice that you cannot do so directly anymore. For instance, if you try to download the latest Atom editor builds, you get the warning message. The browser displays a "deceptive site!" warning when you click on a download link and states that site the downloads are hosted on has been reported and blocked. Downloads on GitHub are powered by Amazon AWS. This web page at "site url" has been reported as a deceptive site and has been blocked based on your security preferences. Deceptive sites are designed to trick you into doing something dangerous, like installing software, or revealing personal information, like passwords, phone numbers or credit cards. 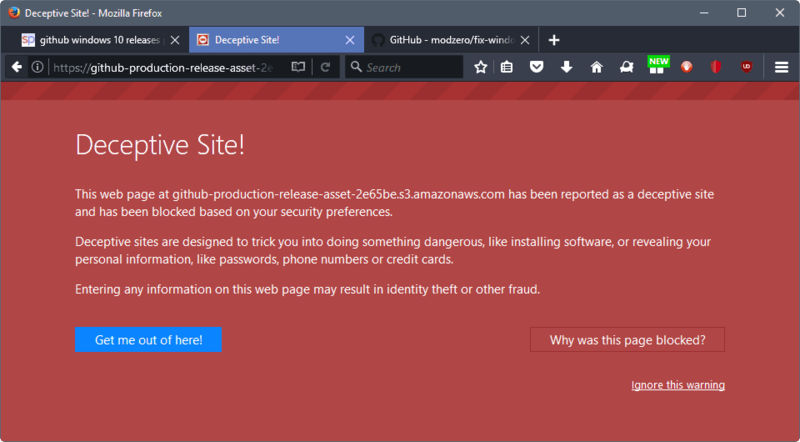 I tested this using Firefox Stable and Firefox Nightly, and both browsers showed the "deceptive site" intermediary page for most -- but not all -- GitHub release downloads that I tried to download. Source file downloads don't seem to be affected, but any other download, be it for Windows, Linux or Mac, appears to the flagged by the Firefox browser currently. While it is theoretically possible that the whole of GitHub has been compromised, it seems highly unlikely. Firefox users may bypass the warning to continue with the download. When you get the "Deceptive Site" warning in Firefox, click on the "ignore this warning" link displayed in the bottom right corner of the warning page. This bypasses the warning page and starts the download of the selected file. I tried the downloads in other browsers, thinking that it may be a problem with Google's Safe Browsing security feature. Chrome downloads these release files just fine however which means it is probably not, unless Mozilla uses a different version than Google does. This is a misconfiguration most likely, and something that will probably be resolved quickly by Mozilla. It is interesting to note that this affects Mozilla's repositories on GitHub as well. The Firefox web browser blocks all GitHub release downloads right now by marking the download site as deceptive and displaying a warning page. Doesn’t seem to be a problem at https://github.com/pirate/sites-using-cloudflare which loads normally. This has no releases. This affects only the releases. Of course it’s possible that they fixed whatever was causing the problem before. Correct! Why the deceptive headline then if you even realize this in the foot note? I’m no Mozilla apologetic like Sören, but Firefox and Mozilla are innocent this time. >Security Agency allegedly uses to identify individual computers for purposes of exploitation. I can’t understand why HK-Rapper seems upset. Has the article title already been edited, prior to my reading? I’m saying: Martin, thanks for the article. Whatever the cause of the problem ~~ mismatched certificate, cross-site scripting, fumbled http header redirects… firefox’s handling of the situation is non-ideal. Upon encountering such a block page, I’m unsure what a user SHOULD choose to do: proceed? exit? clear browser cache and retry? restart bind9 service? attempt reaching “github” via a proxy? wait, and try again later in the day? toggle off (or on) SafeNanny and try again? No it has not been edited. I’m not upset and I enjoy Martin’s site a lot. The thing is, this is a “Google Safe Browsing” message. So it would have happened on all the browsers I’ve mentioned above, not just FF. For journalistic completeness this should have been tested with more browsers and GSB on/off, a different headline reflecting on it. Occasionally people report safe websites to GSB in order to grief. Whatever caused the site being flagged as bad surely is gone. I never noticed it because I don’t trust google. The wiki article sheds light on the privacy issues with GSB. I tested this in Chrome and it did not happen. It only happened in Firefox. If it would have happened in all browsers that use Safe Browsing, I’d use a title that reflects that, but it only happened in Firefox. The only problem I have with github recently is that damn banner “Join github today” that seems to be prone to remember that I’m not interested when I click “dismiss”. And the problem you’re talking about may be related to safe browsing/pishing protection component – I have turned these lists off and I see no problem with accessing page. If you’re using uBlock (or something similar like AdGuard), you can simply block the banner by right-clicking it and selecting Block Element. Still me: v 5.0.7.1 [XSS] Fixed bug causing false positives (thanks Georg Koppen for reporting). Useless to block most popular sites anyway. Makes no sense. GitHub is especially designed to share files and knowledge. I recently had similar popup banner on ghacks, after 1 day or so it went away. Maybe just False/positive on adblocker. Fun thing I disabled adblock for ghacks. Well, today I couldn’t access this GHacks page in Firefox. I kept getting a “problem prevented this page from loading” message, I think from AdBlock. When I “temporarily enable all this page”, the page finally loaded. Don’t know which server or script was the problem. uMatrix says it is a script from http://www.ghacks.net. I blocked it, no “problem prevented this page from loading” anymore. WaterFox doesn’t have this; and it’s a superfast browser too. An error occurred during a connection to github.com. Disabling HPKP resolves the issue but do so at your own discretion. https://twitter.com/GitHubHelp/status/889866861801766913 They have fixed this. I tried to download from mentioned site ( firefox browser ) and was no problem .